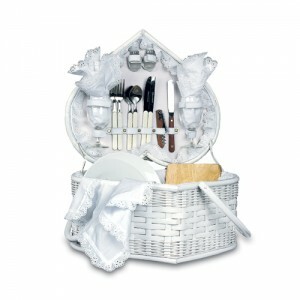 The romantic heart shaped wedding basket is a popular wedding gift for many reasons. First of all, it is so beautiful, I have known clients to display it opened up, almost like a piece of furniture in their home. Secondly, it helps to continue the romance long after the honeymoon is over. It can be used for a romantic picnic, a day at the beach, a concert in the park, or an y outdoor event. This beautiful picnic gift comes with a complete service for two. It includes two wine glasses, lacey linen napkins and tablecloth, cheese knife, cutting board, salt and pepper shaker, bottle opener, silverware, plates, and picnic container. The elegant basket is lined with a lacey fabric to match the linens. The deluxe version of the gift also includes a romantic Sweetheart Box from Kama Sutra, gourmet delights, cheese, crackers, wine and fine, hand made chocolate truffles. Every time the couple uses it, they will be reminded of their wedding day, and the person who gave them this special gift.